Born in 1829 from pious parents of very modest means, St. John was quick to learn the power of prayer. As a child he was a slow learner, but one night after fervently praying for God’s help in his studies, he suddenly felt as if he were violently shaken, as if “the mind opened up in his head.” From then on he became a good pupil, graduating at the head of his class. 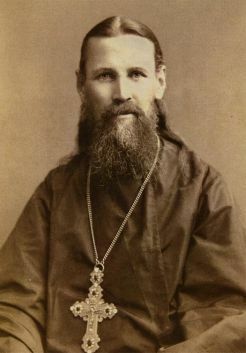 He went on to seminary in St. Petersburg where he began to prepare for missionary activity in Siberia and Alaska. But in a dream he saw himself as a priest in a large cathedral and soon thereafter he married and was ordained and appointed to serve in the St. Andrew Cathedral of Kronstadt–the very cathedral which had appeared in his dream. Kronstadt was a port city full of poverty, drunkenness and immorality. It was here that Father John poured out his compassionate love and began his extraordinary ministry founded on prayer. Literally thousands, including Jews and Moslems, flocked to him for spiritual and material aid and were witnesses to his God given powers of healing, spiritual discernment and prophecy. 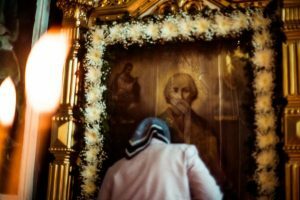 His genuine Christian love brought many to repentance and conversion and the cathedral which held up to 5,000 people was packed every day for Divine Liturgy. He died Dec. 20, 1908, and his funeral, attended by tens of thousands, conveyed that radiance of Paschal joy which constantly shone upon the face of Father John whom many affectionately called, the “Easter batiushka”. “Once ordained a priest and pastor, I soon learned through experience with whom I had entered into combat in my spiritual arena, namely with the powerful, cunning, unsleeping prince of this world, who breathes evil and perdition and the fire of hell, and with the sub-celestial spirits of evil …. This battle with the strong and cunning invisible enemy plainly showed me how many infirmities, weaknesses, and sinful passions there were in me ,–how strong a hold the prince of this world had over me, and how I had to struggle hard with myself, with my sinful inclinations and habits, and conquer them, so as to be as far as possible invulnerable to the arrows of the enemy. “In this warfare I have come to know the immensity of God’s long-suffering to us; for He alone knows all the infirmity of our fallen nature, which He mercifully took upon Himself, except for sin (I Peter2:22; Isaiah 53:9; I John 3:5; 4:10; Hebrews 4:15), and therefore He commanded us ‘seventy times seven’ times to forgive the sins (St. Matt. 18:22) of those who have fallen into them; and He has surrounded and continued to surround me everyday with the joys of salvation from sin in peace and expansion of the heart. The Divine mercy which I have experienced and the perpetual nearness to me of the Lord confirm me in the hope of my eternal salvation and in that of those who follow and hear me to salvation, according to the word of the Scriptures, ‘Behold I and the children which God hath given me'” (Heb. 2:13). St. John’s diary, My Life In Christ, has been called a manual of weapon training for this warfare which every Christian must fight in order to reach the heavenly homeland. In the following excerpts from this diary may be seen not only the emphasis which Saint John placed on true prayer as the greatest weapon of every Christian and his deep understanding of the human soul, but also the very practical aspect of his teaching which is of such value to Christians today. Both public and private prayer are necessary in order that we may lead a truly Christian life, and that the life of the spirit should not become extinct in us. It is indispensable that we should attend divine service in church with faith, zeal and understanding, just as it is indispensable to provide a lamp with fuel or power if it is to burn and not to go out. The sin of inattention is one to which we are greatly subject; we must not disregard it, but must repent of it. We give ourselves up to it not only at home, but in church as well. Simon, Simon, behold, Satan hath desired to have you, that he may sift you as wheat; but I have prayed for thee, that thy faith fail not. The causes of inattention are the Devil, and our manifold attachment to the things of this world; its reason is want of faith; the means to overcome it is fervent prayer. When praying, we must believe in the power of the words of the prayer, in such a manner as not to separate the words from the deeds they express; we must believe that deeds follow the words, as the shadow follows the body, for the word and the deed of the Lord are indivisible, for He commanded; and they were created (Ps. 148:5). And you must likewise believe that that which you say in the prayer, for which you have asked, will be done. You have praised God, and God has received your praise. You have thanked God, and God has received your thanks as a spiritual fragrance. It is our misfortune that we have little faith, and separate the word from the deed, as the body from the soul, as the form from the contents, as the shadow from the body–that during prayer, as in life, we are sensual, having not the Spirit (Jude 1:19), and therefore our prayers are fruitless. At the end of your morning and evening prayers in your home, call upon the saints: patriarchs, prophets, apostles, hierarchs, martyrs, confessors, Holy Fathers, the ascetics, the unmercenary, so that seeing in them the realization of every virtue, you may yourself become the imitator of every virtue. Learn from the patriarchs childlike faith and obedience to the Lord; from the prophets and apostles, the zeal for God’ s glory and for the salvation of the souls of men; from the hierarchs, zeal to preach God’s word, and in general to assist through the Scriptures, to the possible glorification of God’s name, to the strengthening ‘of faith, hope, and love amongst Christians; from the martyrs and confessors, firmness for the faith and piety before unbelieving and godless people; from the ascetics, to crucify your own flesh, with its passions and desires, to pray and think piously; and from the unmercenary, not to love gain, and to give gratuitous help to the needy. How can you worthily, with faith and love, receive the Body of Christ when you despise His members or have not compassion upon them? All Christians are members of Christ, and especially the poor. Love His members, have compassion upon them, and the Master will plentifully bestow His rich mercy upon you. And can any mercy be greater than that which our S a v i o u r bestows upon us in the communion of His most pure body and of His most pure blood? 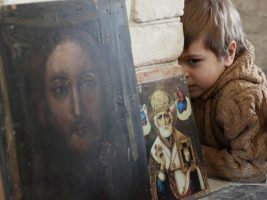 Those who attend the divine service of the Orthodox Church must bear in mind that its purpose is to prepare us for the joyful service of God in heaven; that in serving God with the body, it is still more necessary to serve God with the soul and a pure heart; that in hearing divine service they must learn to serve God as those saints served him, whose lives, and works of faith, hope and love, we hear of during the service; that God should, above all, be served in deed and truth, and not only by words and the tongue. The Church is the sure way to the life eternal; walk in it undeviatingly, hold fast to it, and you Will gain the’ kingdom of heaven; but if you turn aside at the crossways of your own sophistry and unbelief, then you have only yourself to blame, you will go astray and be lost. I am the way, the truth, and the life (St. John 14:6).